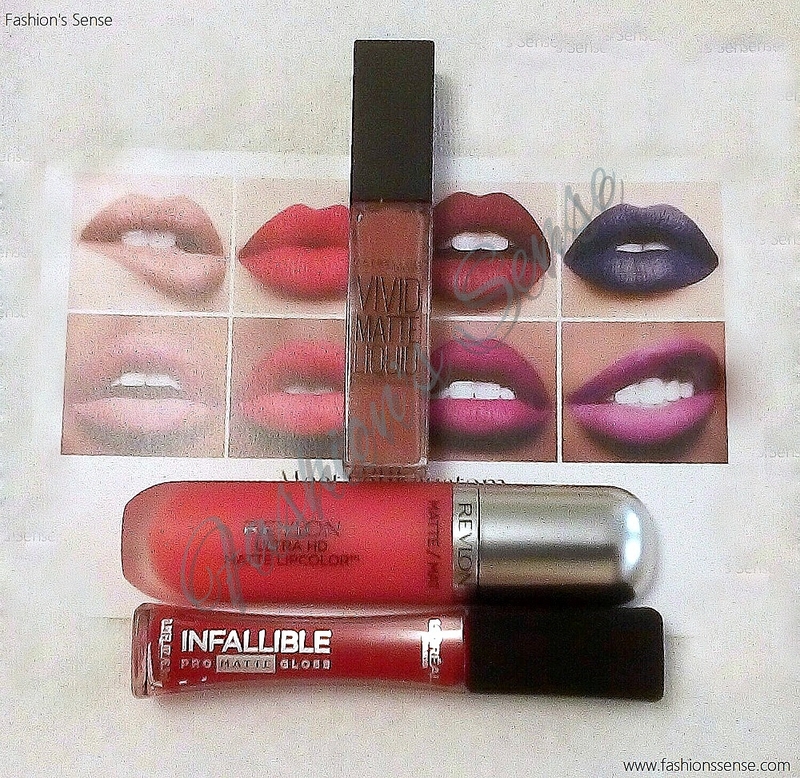 Fashion's Sense: Maybelline, Revlon, L'Oreal: Which Drugstore Liquid Matte Is Better? Maybelline, Revlon, L'Oreal: Which Drugstore Liquid Matte Is Better? As soon as 2016 arrived, a flood of new makeup products entered on the scene. Three of the major drugstore brands, Maybelline, Revlon, and L'Oreal came out with liquid matte lip colors. Of course, I had to try these new formulas out and see how they matched up. This is the first time they have ventured into the popular liquid lipstick venue. Up front, do not expect for these to be a true matte. None of the brand's developed a true, flat matte liquid lipstick. Some ranged from a dull gloss (barely demi-matte) to a satin finish (semi-matte). Anyone devoted to Colourpop, Jeffree Star, or even NYX mattes will be greatly disappointed. The formulas are transferable and not long-wearing (as we expect liquid mattes to be), so you will need to touch up after drinking or eating. In addition, they are not cheaper than NYX or Colourpop (unless you catch a sale). Now let's take a look at how well each brand's matte formula performs. Maybelline Vivid Mattes Liquid Lipstick can barely be considered a matte. The formula looks like a cream lipstick with a soft sheen. The darker the color the less evenly the product applies. Possessed Plum tends to streak requiring more care with application. This is not the one to try if you are a matte lipstick devotee. However, if you like liquid lip color without a glossy finish this a good choice. Just layer color to make it last longer. Infallible Pro-Matte Gloss by L'Oreal is a bit of an oxymoron. This liquid lipstick is claiming to be both matte and a gloss which is impossible. Really, no one should be surprised that this formula is not a true, flat matte. Yet, it has more of a matte finish than Maybelline's Vivid Mattes. It is very comfortable to wear. You will need to reapply it after drinking or eating, so layer your color. The Ultra HD Matte Lip Color is the closest of the three to true matte. The formula dries to a semi-matte finish. It is moisturizing, so you do not get the feeling your lips will dry out. There is a hint of sheen that lingers. If you lightly pat your finger over your lips, that sheen will disappear. Again, the color is not "stay put". Therefore, I recommend layering color so it will last a little longer. Which Drugstore Liquid Matte is Best? My pick is Revlon's Ultra HD Matte Lip Color with L'Oreal's Pro-Matte Gloss a close second. If you are new to liquid lipsticks then test the waters with Maybelline's Vivid Mattes. For diehard matte lipstick lovers, none of these will impress you. You'd do better with each brand's solid matte lipsticks or fall back to Milani’s liquid lipstick if it is sold at your local drugstore. Which drugstore matte will you try next?